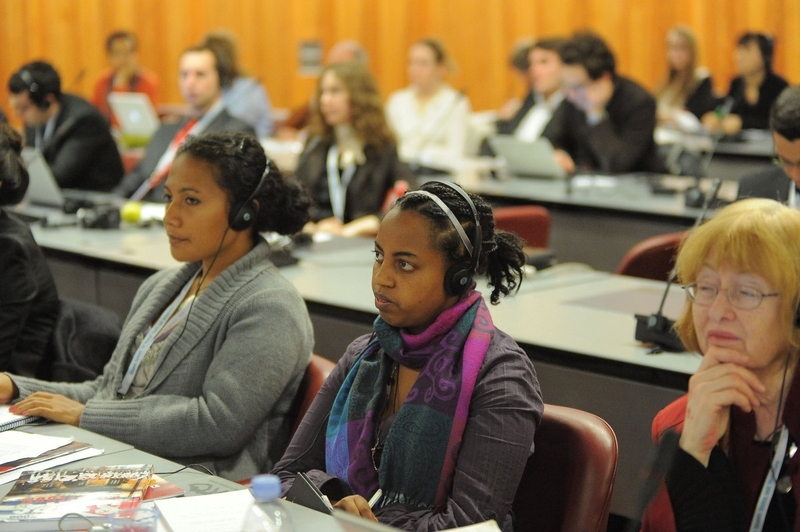 A joint article by Alemtsehay Zergaw and Jenta Tau (2011 Interns of the World YWCA) on their experience at the 16th UN Human Rights Council, which was held from February 28 to March 25th 2011. The UN Human Rights Council holds its annual meeting every year in Geneva, Switzerland. This year, we had the opportunity to attend the meeting and participate in various side events. With both of us coming from places very different from Geneva (Jenta from the Solomon Islands and Alemtsehay from Ethiopia), we were both enthusiastic to visit the UN building in Geneva. We had both heard stories about this building. Jenta has a close personal story as her brother used to attend conferences at the UN office in Geneva. Alemtsehay had learnt in her history classes about Emperor Haileselassie’s most historic speech to the League of Nations against the Italian invasion of Ethiopia in 1936, in this historic building. We were both so excited that we purposefully lost our way in the compound until a security personnel found us and guided us to the main gate. The first conference we attended was on March 3, and it was about how to help new comers like us understand how NGOs contribute to the United Nations Human Rights Council. Different speakers from civil society groups shared their experiences on how to advocate for ones cause. The discussions helped us to understand the communication mechanisms between governments and non-governmental organizations. The next programme was a side event to discuss the challenges children face because of harmful traditional practices. Alem gave a speech on this event regarding the challenges the girl child faces in Ethiopia, particularly because of harmful traditional practices, and other repressive societal norms and poverty. Speakers from Pakistan, Italy, Albania, and Benin also participated in the event. The third side event we participated in was focused on women’s rights and food security. Jenta learnt a lot from this session as she has always wanted to understand the challenges women and children in agrarian societies in Sub-Saharan Africa face from prolonged and recurrent drought and food insecurity. The last meeting that we attended was the 3rd Annual Geneva Summit on Human Rights and Democracy on March 15, 2011. This was different from any of the sessions we attended earlier that week. There was a huge audience and the summit covered more wide-ranging issues from around the world. Around nineteen speakers, including world-renowned human rights and pro-democracy activists, former political prisoners, experts and diplomats, presented their views on a variety of topics on the objective of advancing human rights. The summit also included an exhibition on the North Korean political prisoner camp. After the summit, we had a long, good, conversation about the definition, meaning and extent of human rights, the paradox of double standards, the amazing similarity of dictators from different countries and times, and much, much more! We looked at the geopolitical map of the world, and discussed about what role women leaders and politicians can play in shaping this map for the better. Conversations centred on ways in which peace can be defended across the world, and what unique contribution influential women leaders can bring in the defence of peace. The summit was, in a way, an eye opener for us to understand the difficulty and complexity of international politics and human rights around the world and the forces that shape them. Afterwards, we raised many questions for ourselves which we will still have to search for the answers. But for now, we are grateful for the World YWCA for giving us this great opportunity of a lifetime.